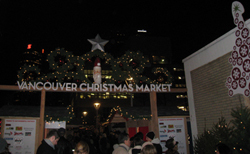 The first inaugural Vancouver Christmas Market will hopefully become a new tradition here. 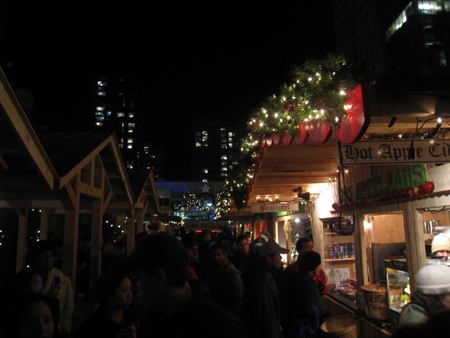 After visiting the German Christmas Markets in Manchester, England I was very happy to hear we’d be getting our own. While it’s not quite like the ones I’ve been to in England (and I’m sure even less like the ones in Germany) we still managed to have fun. Remember to bring cash!! Lots of cash because 1.) it’s expensive and 2.) you will want to eat all.the.things. 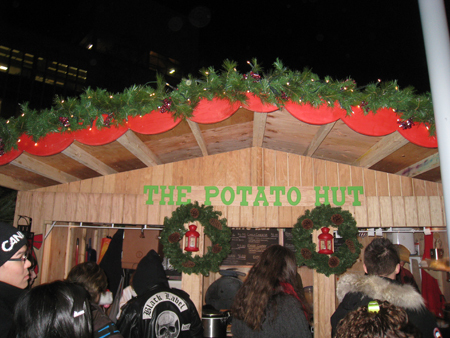 First stop (after $5 entrance and getting our alcohol wristbands) was The Potato Hut. 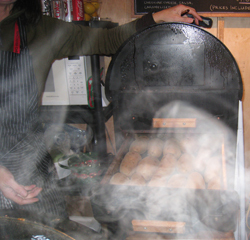 Some of us waiting in this line up, while a few others waiting in the Sausage line-up to buy bratwurst. I got a baked poutine potato ($7.50) with cheese curds and gravy. While Hilary insisted it wasn’t real poutine, I insisted it was delicious! 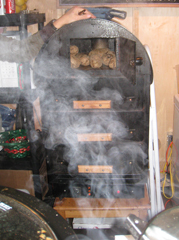 Check out the awesome (and steamy) traditional potato baking oven with warming drawers. So awesome! We were so excited about this and all taking photos. The lady at The Potato Hut said we needed to get out more. Too true, too true. 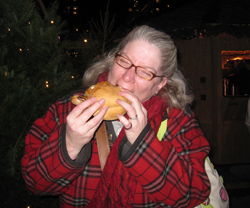 Tammy enjoying her bratwurst sausage and some costumed stilt walkers at the Market. 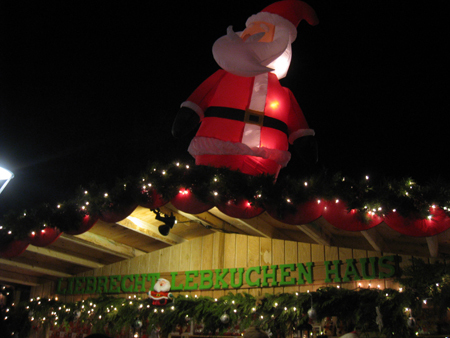 Giant Santa on Liebrecht Lebkuchenhaus which sells traditional European treats including all types of gingerbread, marzipan and other sweet delights. Then someone mentioned there were crepes — both fruit and meat types. Ferdy and I began chanting “crepes! crepes!” We headed towards the crepe hut but discovered they were out of apples (I was planning to get an apple cinnamon crepe). 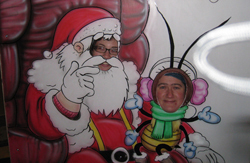 Erin the baby bee sits on Santa Janel’s lap and my steaming gluwein in commemorative mug. 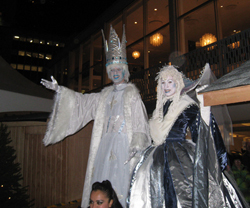 Our last line up was for drinks, which some people had already had too. 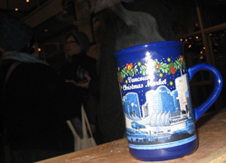 I got a mug of spiced apple gluwein ($6 plus $4 mug deposit). Very alcoholic! 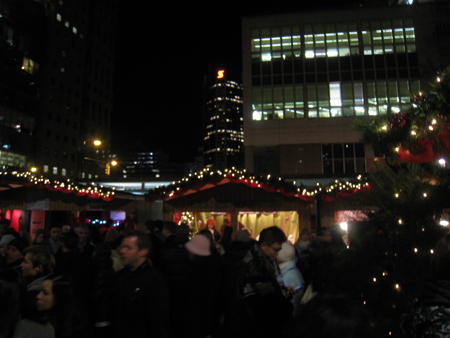 I would have been happy with just a spiced rum apple cider, but it also had mulled wine too. Wowza. I kept my commemorative mug as a souvenir, but a few people returned theirs to get their $4 back. We also enjoyed the music of Maria in the Shower playing in the gazebo. There was all different entertainment nightly. All in all we had a lot of fun. We were chatting in the line-ups and enjoyed the food immensely. I think they had to have a closed-site with entrance fee in order to get the liquor license. We have much stricter street-drinking laws than Europe. The site was packed with people (on a Saturday night) and I would love to see the site expanded next year to include more walking room and even more vendors! Officially jealous! How fun (and yummy)! Loved the creative menu items at The Potato Hut….great job spud heads!